We are following Jens Dahle and his Civil War experiences in Salisbury Prison in North Carolina at the time of the 150th anniversary of those events. Jens has been released from prison (22 February 1865) and traveled by train (other able bodied prisoners had to walk) to Richmond from Salisbury, North Carolina. On March 10th a prisoner exchange occurred at Cox’s Landing and Jens probably was loaded onto a steamer. On 13 March he crossed into Union territory, location unknown but possibly Annapolis. Two days after being repatriated with the Union army he probably boarded a train and traveled to Benton Barracks in St. Louis, Missouri where he arrived on 23 March 1865. I found difficulty in obtaining much information on the Benton Barracks. The area has been cleared for many years now. 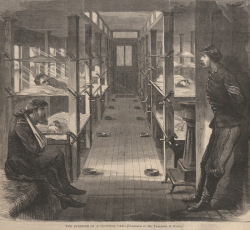 Benton Barracks was a combination of a Union tent city–it was described as long rows of tents up to a mile long– and a hospital and large parade grounds. Nevertheless, Jens stayed only long enough to receive a 30 day furlough (like James Everhart) and within two days of his arrival he boarded another train, this time to Chicago. It is not known if Jens traveled in a new innovation for moving the sick and injured–the hospital train– shown above in the lithograph, but it is likely. Given his emaciated condition this seems like the most likely occurrence. Or, maybe I just want to think that maybe he was transferred in this type of transportation because it seems more humane. Jens has now been traveling for about a month since his release. The end of the war now seems inevitable.